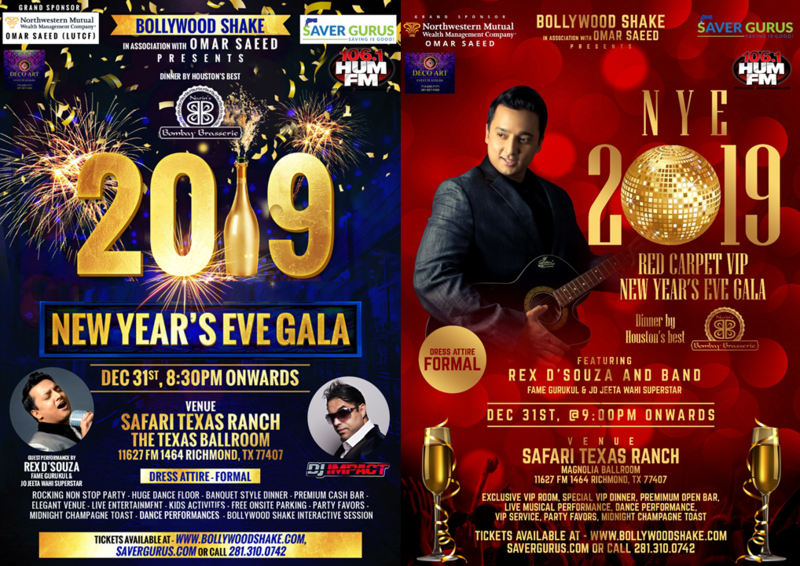 New Year's Eve Gala - Bollywood Shake Dance, Fitness & Entertainment - Austin, Houston, Texas & More! 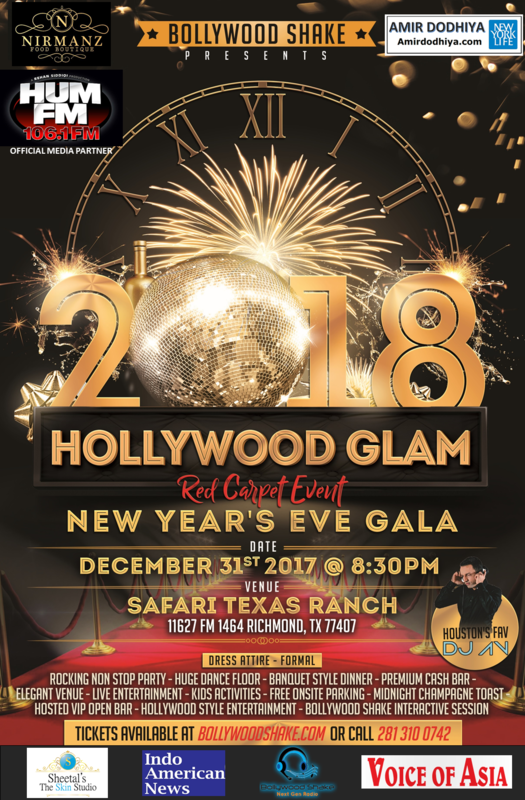 Bollywood Shake brings you its 4th Annual New Year’s Eve Gala 2018 at Safari Texas Ranch Grand Ballroom with style, glamour, elegance & entertainment. This year's Hollywood Glam Red-Carpet Event theme will make this year's event more glamorous and classy!! 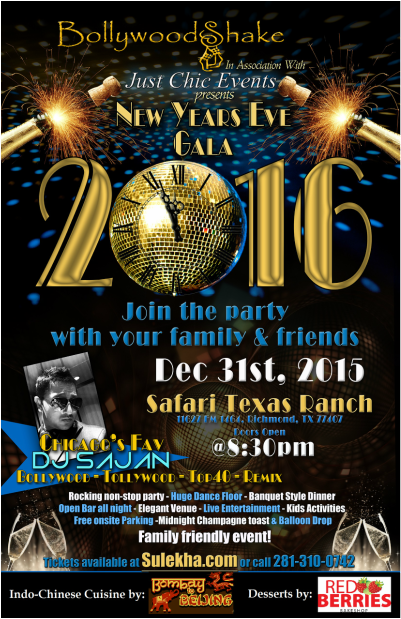 GET READY to ring in the New Year at the most elegant and happening Family Friendly New Year’s Eve Party in Texas! Be there to experience a very memorable event!! 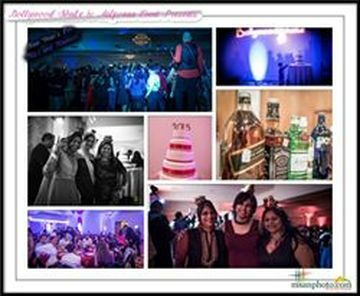 Open Seating (first-come-first-served), Appetizers and Dinner Buffet by Nirmanz Food Boutique (8:30-10:30PM), Party Favors, Soft Drinks, CASH BAR, Midnight Champagne toast (alcoholic and non-alcoholic) and Midnight Countdown. VIP Reserved Front Seating, Hosted OPEN BAR for 2 hours (9:30-11:30pm), VIP Lounge (*NEW this year), Separate Dinner Buffet Area and VIP Service. Pizza, Separate Kids Area, Kids Entertainment including face painting, balloons and magic show, Soft Drinks and Party Favors. WHY YOU SHOULDN'T MISS THIS PARTY!!! 10 REASONS to ATTEND this party! #1. Exquisite, upscale and premium venue close to Sugarland and Katy! #2. Royal Cuisine including mouth watering appetizers and royal dinner buffet catered by Nirmanz Food Boutique. #3. Houston's Top DJ AV will be spinning Bollywood, Top 40 & Remixes all night! HUGE Dance Floor!! #4. LIVE entertainment including Live Singing, Bollywood Shake Dance Performances & Interactive Session! #5. Unlimited non-alcoholic beverages. Premium Cash Bar with alcoholic beverages (Specially Negotiated Discount Prices - $5 Beer, $6 Wine, $7 Premium Mixed Drinks). VIP Tickets include 2-hour hosted open bar. #9. 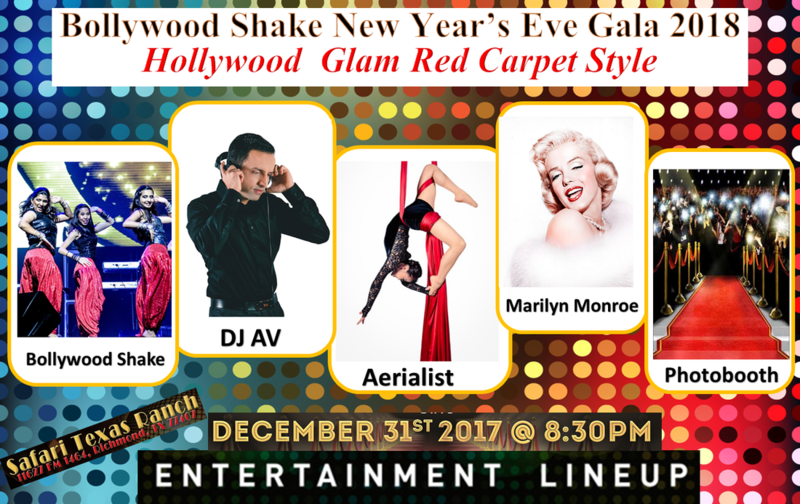 Hollywood Glam Red Carpet style theme - so bring your cameras! #10. 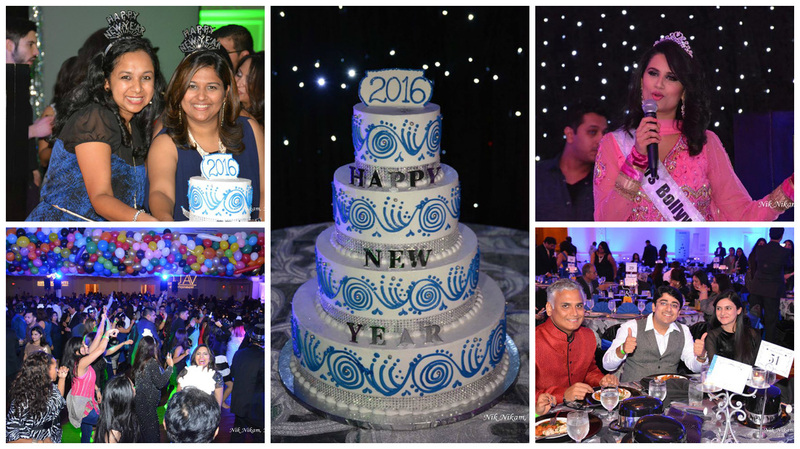 Excellent and outstanding event management for a memorable New Year's Eve experience!! Mouthwatering Appetizers and Royal Dinner Buffet catered by Nirmanz Food Boutique.